The need for a core group with a coherent vision is often regarded as vital to starting a community that lasts. 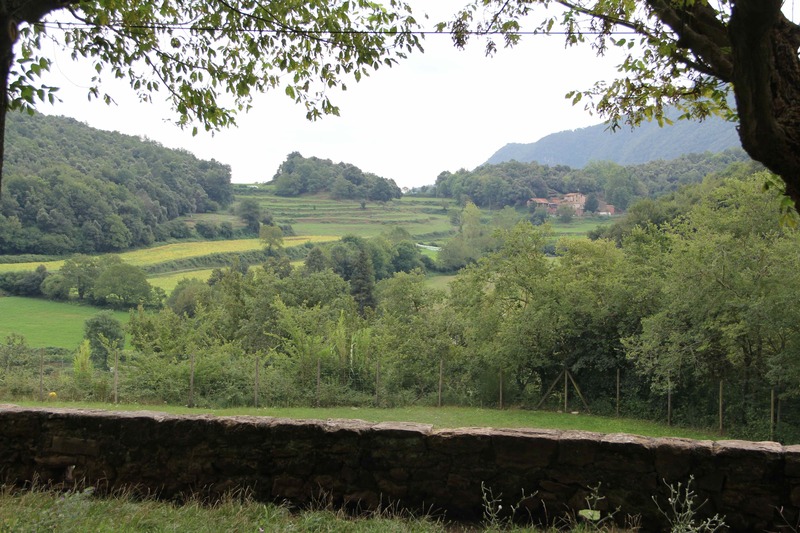 I reflect on feedback on our Monastery of Dreams intensive in relation to visits to several formed and developing communities in Catalonia in 2013. We visited Kanawen, Arcadia, Arlequi, Cal Cases, Can Masdeu, Esblada, Irehom, Cala Fou and Molinàs. I also offer a brief history of the group that formed to set up the Monastery of Dreams and the extent of our mutual involvement to provisionally suggest that a lack of strong group vision in our case reflects the trust born in our common practice of CI and an explicit wish to expand our network to encorporate other visions through the residency and intensive process. 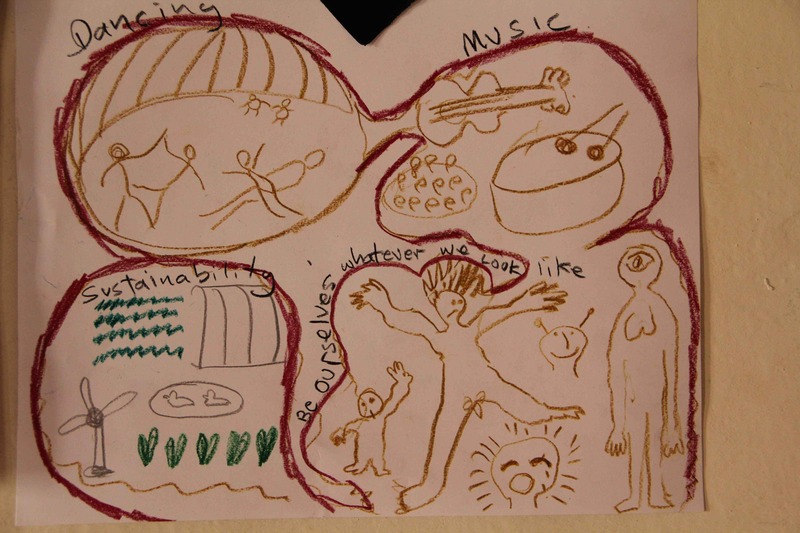 I conclude with a call for a different idea of visioning that is sensitive to dance, art practice and improvisation. In her hugely influential book ‘Creating a Life Together’ Diane Leafe Christian argues that a strong vision and one preferably developed over many conversations and group processes is one vital part of the development of a successful intentional community. I believe it was this widespread idea that Jashana Kippert was referencing when she expressed her appreciative surprise for how we as a group has managed to hold the space for a tremendously productive intensive at the Monastery of Dreams in which more than thirty people participated, without an agreed group vision. 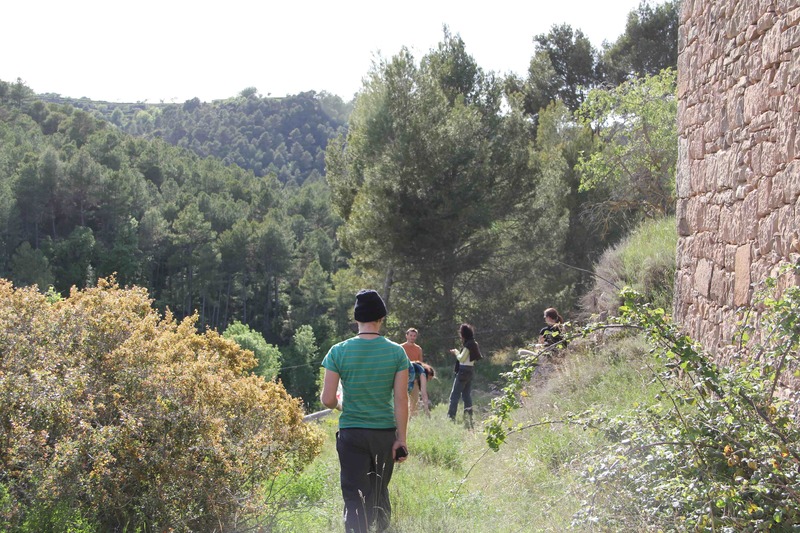 The first thing to explain is that while some of us had visioned together in the past, or had a sense of a shared purpose, the group that finally came together to organise the residency and intensive did so under quite precarious circumstances. We did not know if we would be able to rent the monastery until we actually had the keys. Some of us knew each other well, others not at all. On the website where we invited people to the community experiment nine of us were named. Daniel, Gabriel, Melody, Jenny, Mike, Free, Laurence, Gavin and Sonja. The order is significant for the first three names. Daniel was the most connected of all of us to Catalonia through his long stay in Can Masdeu, speaking Catalan, being in partnership with Queralt and having a child here. If there was one person who was most vital in terms of linking and connecting others it was him. We would not have learned about the Monastery at all, without his involvement, enthusiasm and presence at Can Masdeu. The initiative of Melody and Gabriel helped by Daniel facilitated the first visit to the monastery, which then galvanised us into action. They recounted their first visit on a blog post and also attached lots of photos, which gave us a sense of the place but not its magic or potential. I wonder if the journey of imagining what it was like from hearing accounts from others (eg it is too big), looking at Googlemaps, seeing photos to finally arriving and experiencing it as a social place can offer a cautionary perspective on trusting our own visions of what community needs to be for us? 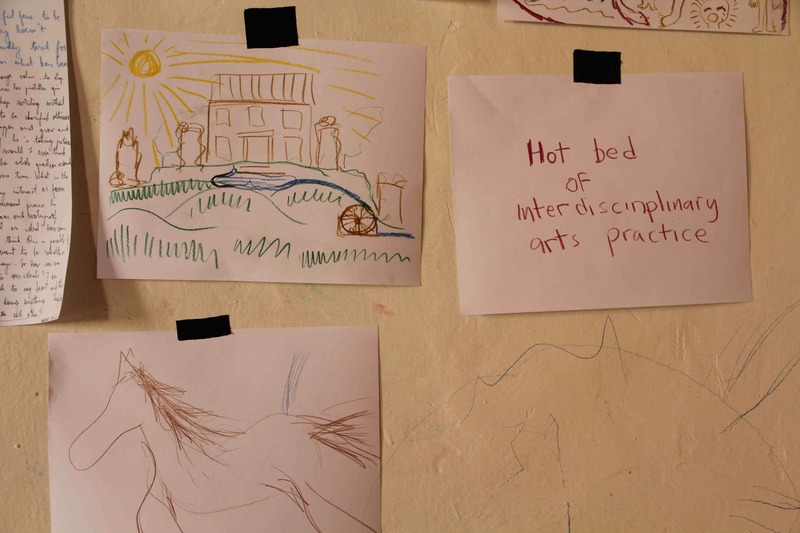 Could the journey of imagining of the Monastery from second hand information to finally experiencing it with others be a metaphor for the difference between community visioning and actually living in community? Do we really have the capacities to really imagine what a community would be like for us? I see more of the value of visioning in the mutual learning of doing with others, than in the actual content of the visions. So what of the connections in the rest of the group. Sonja and Free had been involved in discussion around community in Spain for many years and were part of a wider network of people similarly interested. Daniel and Jenny developed the concept and practice of Bread and Jam (Building Relations, Eating, Active Discussions) in January 2013, which presented an extended practice of CI into conversation and sharing food. This was a strong philosophical step in the direction of showing how CI is already integrated in activity that create community. Free also had been living and studying in Barcelona for a considerable time and so was well connected to the contact community there. He has considerable experience with communities and setting up festivals (Ecodharma, Buddhafields). 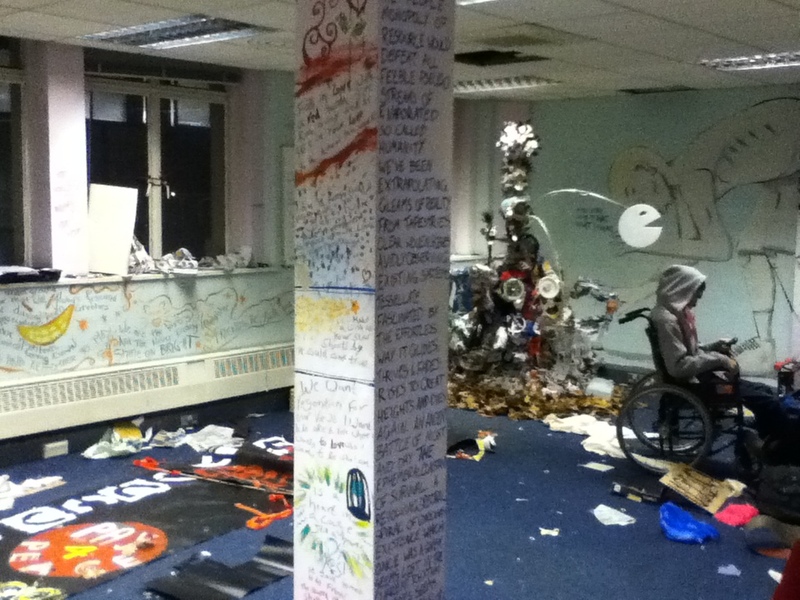 Sonja, Free and Daniel shared an activist interest in CI and had been involved in bringing CI to the Bank of Ideas, set up in a squatted bank in the City (Photos below). 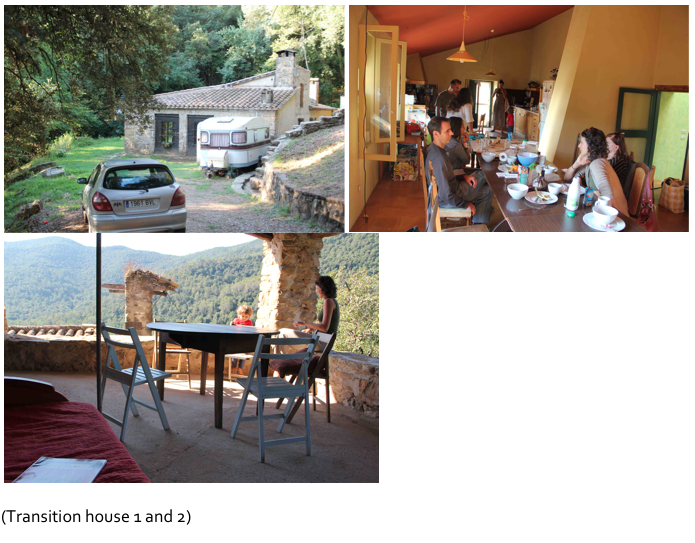 Jenny, Daniel, Sonja and I were involved in a few previous visioning experiments in Cardona, Catalonia that included other people. Melody, Gavin, Jenny, Sonja, Laurence, myself and others had been part of an experimental lab in London where we explored the boundaries and potentialities of CI, using a Bread and Jam structure. 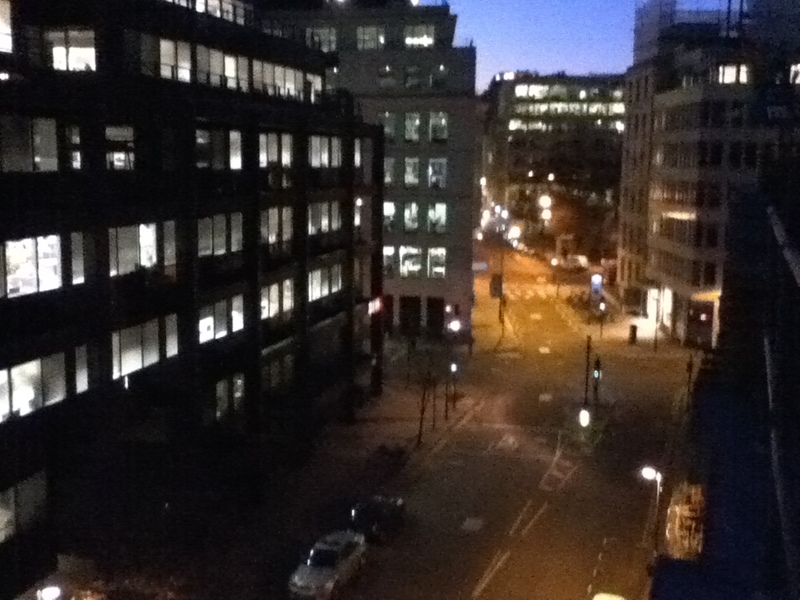 We were also part of a very social CI scene in London. There was trust based on having been to many jams and social events together. None of us had properly met Melody’s partner, Gabriel, in person until we saw him at the monastery. Through skype and extensive emails we came to agreements together that constituted us as the organising group with roles which developed before and after we arrived at the monastery. We also shared a financial commitment to paying for the rent for the initial two months planned and a degree of liability should not enough people come. (For more information about us-go to the facilitators page on the Monastery of Dreams website). I arrived in a mood of gratitude that this residency was even possible. Without the initiative of Melody and Gabriel and the considerable support of Daniel none of us would have had the opportunity to even arrive the monastery, let alone spend time there. Without the active strategic planning of Jenny and Sonja at key moments, what we could do in two months was not imaginable. Jenny had been particularly pro-active at the Dance is Peace event in Lviv and NIM in Norway to ensure the wider community was informed about our initiative. Without Gavin and Laurence committing themselves to extensive planning and being on site, quite apart from their financial input, we would not have been able to ahead. All our networks and the relationships we had with others were key routes through which people heard of the project and then had sufficient confidence that it would be worthwhile coming at short notice. At the end of the intensive week, Jashana led a circle of appreciation to remind ourselves and to make real all that we appreciated about each other. It was a vital exercise of grounding and recognition. Exploring Cala Fou in 2013. While for me, just being there was something to be grateful for, many others arrived not in that mood, but in one of curiosity, contribution and desire to be involved. Gratefulness for the authenticity of people’s participation, the sharing, and the human warmth came later, during the sharing at the end of the intensive. Most of us arrive at events without realising the extensive work that has gone into preparing them. The payment of money allows gratitude to take second place to making the most of the event. I’m reminded of the Tongan greeting of Malo e lava mai, which many people translate as welcome, but which literally and emotionally has the quality of ‘thank you for having managed to arrive here to us’ . There is acknowledgement and thanks of the journey and challenge of arriving, which perhaps harks back to a time when Pacific Islanders would make journeys over thousands of kilometres of open ocean. Arrival was never guaranteed, despite incredible seafaring and navigation abilities. At festivals and events we often welcome the arrivals, but not so often thank the organisers nor enquire, how it is that they managed to organise such an event. Enquiring might imply surprise that they could do it, which is a bit of an insult. One could enquire more about the impact of consumerist culture on appreciation and the degree to which the CI community can subvert that, but I should return to the main thread. I don’t know how much people knew of the process of setting up the Monastery of Dreams beyond that of what we put online. Most people, however, arrived with the impression, from looking at our website, that the solidity of the vision of our group might mirror the solidity of monastery building itself. Some arrived with expectations that we might be further along the route of visioning community than we were, others that presence and involvement would inevitably lead to being part of the decision making process of how we go forward. So what kind of group were we nine? At some points we called ourselves the core group and the original decision making group? But then what defined us as a core group beyond the trust some of us had developed in each other over years, and the fortuity of us being available to move this project forward at this particular time. There were many other people who had been part of important conversations, workshops, processes that no doubt could make vital contributions but because of time and other commitments could not attend. So in part we were a group of people, from a much wider network, that happened to be able to commit and could come at some point over the summer to the Monastery. I personally felt the strong need to give the coincidence of us coming together value, but that also related to a desire for some sense of structure and a coherent group to make decisions. Making decisions even in a group of 9 people you know well is a challenge, and we spent much time before the intensive in long circle discussions. Should we open the decision making group to others and on what basis became a question to us? This was an opportunity for reflexivity into our own psychological preferences in groups that also related to our own previous experience of being in groups and deciding in groups. Fears of losing influence or some degree of control in the development of the project was something I experienced as the possibility of others becoming part of the core team became necessary for simply organising and running the place. The subtle difference between core team (the original 9) and core decision making team, which included new vital members, was enough for me curiously to settle into the vital changes. 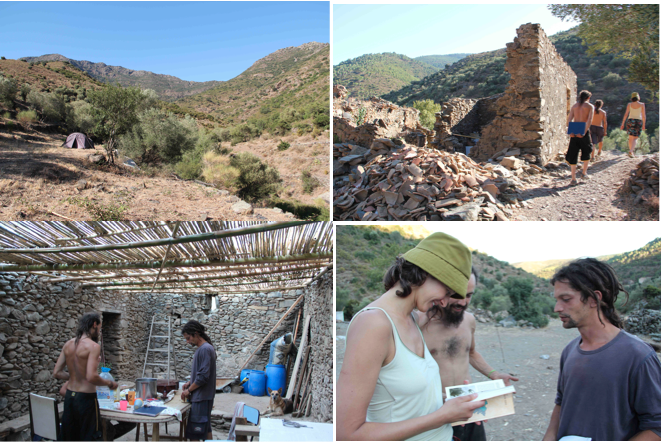 We were developing our structures in the process of being and organising in the Monastery, which is distinct from many groups that spend a lot of time planning and creating a solid group before they inhabit a place. But yet, much of what we did worked well, which had surprised Jashana in the appreciation circle she led. I attribute this in part to the bodily dispositions encouraged by CI and particularly the jam space, which is the acceptance of ambiguity and the building of group confidence. There was a confidence in each other and a trust in each other that I felt underpinned and was enough to ensure things worked, even though we did not have a detailed and extensive (and perhaps prescriptive) vision statement to refer to. Things would work out by allowing the intentions of others to be held and supported and sometimes rejected in the space, rather like a jam, where we had some common understanding of accepted process. That is not to say that it did not require a lot of work and effort, but that that work and effort could be experienced as valued and useful. When I raised Jashana’s comment in a skype meeting a week or so after the intensive when many of us were outside the monastery, several people said that was not true, that we did have an agreed vision. And when they described that common vision in a shared wish to live and create a dance/creative arts community together, I agreed, struck by how that clarity and simplicity united us compared to some of the extremely detailed visions we had worked on previous explorations together. I realised that we had different ideas of vision, and that those ideas of what a vision is, also had impacts and influences on the possibility of sharing it or them, and using them to work together. If an extremely detailed and developed vision is vital for some communities to develop, is it necessarily the model for all communities to develop? Sharing detailed visions of the kind of community we want to live in opens space for distinctions and difference to arise (That’s not the kind of community I want to live in? Therefore I would not want to live with you?). But then that honestly of how we imagine we want to live is a vital process to self learning, even if it might not tell us what kind of community would actually be good for us and/or would work for us? Visions can be as temporary and as connected to the current situation of a person as they are to really identifying how they would feel comfortable living in the future. Tatiana’s revelation, half way through the intensive, that in her community people just liked each other and didn’t have a strong common vision struck a chord in me. It reminded me of other communities I had visited and lived in and made me curious of whether or not an strong founding vision was vital for all of those communities. Or are there ways a group vision can emerge out of the process of actually working and living together? Our invitation to the CI community emphasised a long term interest that some of us had in setting up an international dance centre or community with CI strongly present. 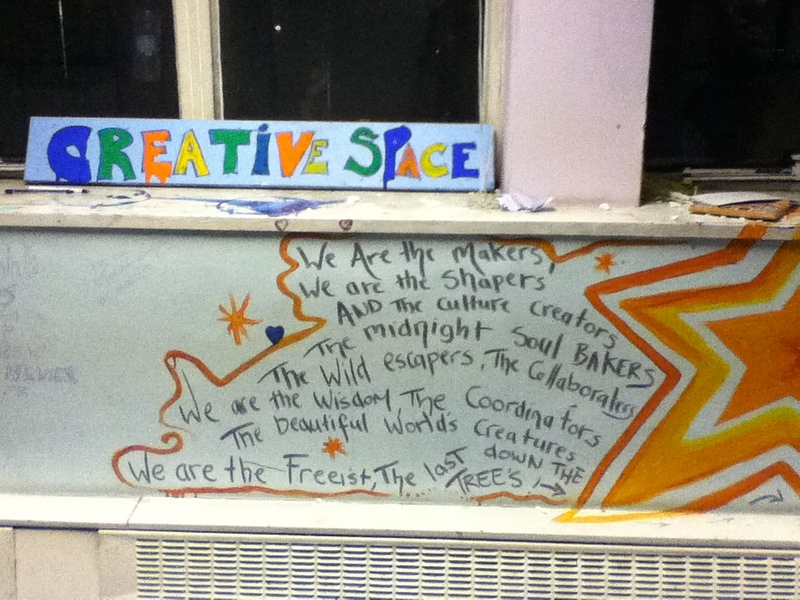 An experiment in community living with a shared practice of creative improvisation. Two years ago a group of friends met to explore the idea of setting up an intentional community based on Contact Improvisation. During this week it became clear that there were several different visions of creative community – not all of which centered on CI. We started dreaming of bringing more people together that are interested in community living and the creative arts to see if any of those seeds could take root and inspire a group to take them forward. This year another friend discovered an old monastery available for sale or rent and we felt that this could be fertile ground for our community visioning. 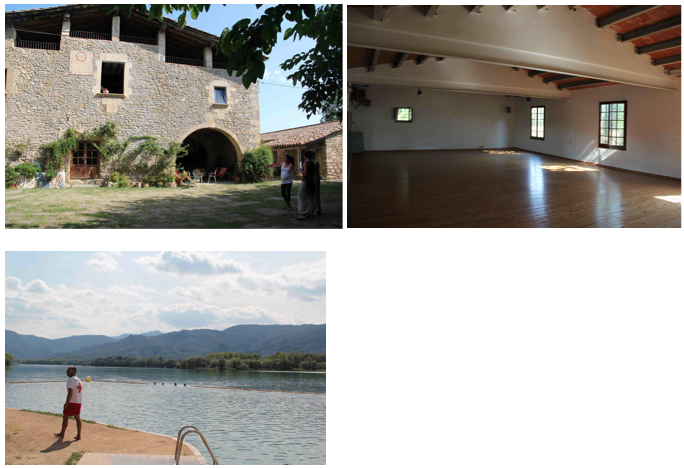 The monastery has very basic facilities, so in order to have our event we will need to co-create our home. There’ll be time to think, create, work, play and explore. We feel living this experience together will challenge our ideals of community and help us to imagine new ways forward. We invite you to take part in this experiment! 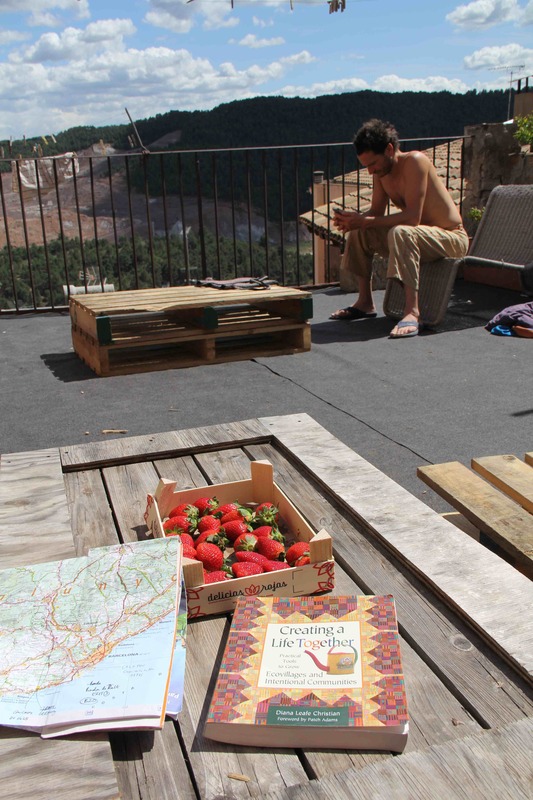 You can either come to our arts residency sometime between 25th July and 13th September or join us for an intensive week from the 1- 9th August. During the residency you are welcome to come at any time, create a home with, share your skills and realise your creative project. 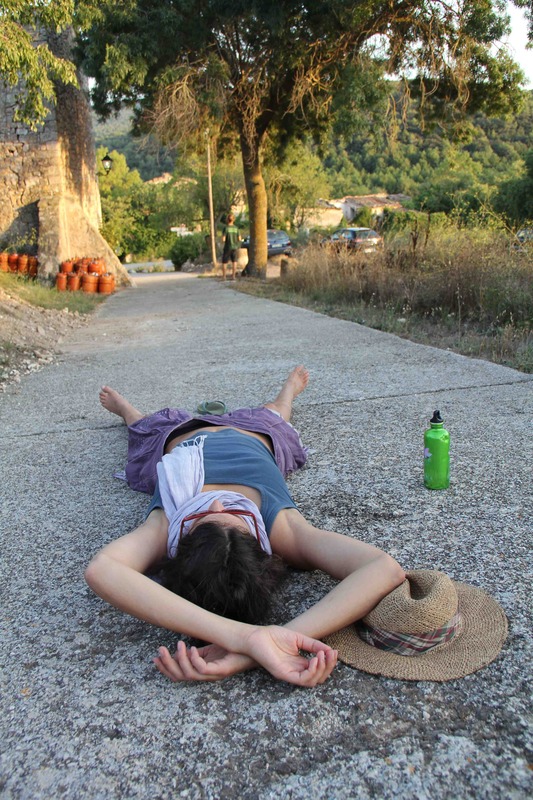 The intensive will be a focused week of exploring community living and creative improvisation. In the morning, there will be on-going groups that explore a particular interest. The afternoons are free for participants to offer workshops or labs, to suggest activities such as trips, swimming, etc. or just to rest and hang out. We will start the evening by getting together to share the findings of the day, and then there will a chance to process further through dance, play, music, words, drawing etc. in an open jam. Gabriel and Melody’s invitation on their blog was more oriented to creative art practice showing that as a group we already had a wider range of visions that suggested by the invitation to the CI community. But very explicitly we framed coming to the Monastery as a ‘fertile ground for community visioning’. For us to be too fixed in our own visions before the event not to be true to the aim of the Monastery of Dreams, which was to dream first. We didn’t want the practicalities to overwhelm the possibility to dream first. So if we didn’t go into great detail at the beginning about our group, the finances, decision making etc it was because we wanted to be open to dreaming and visioning. Some people, of course, need the practicalities to be able to dream. We resisted sharing too much of our own journeys up till the Monastery to create a non-judgemental space for imagination to thrive. Now that the intensive period of visioning is completed, I feel it is appropriate to bring in some of those previous journeys and practicalities. 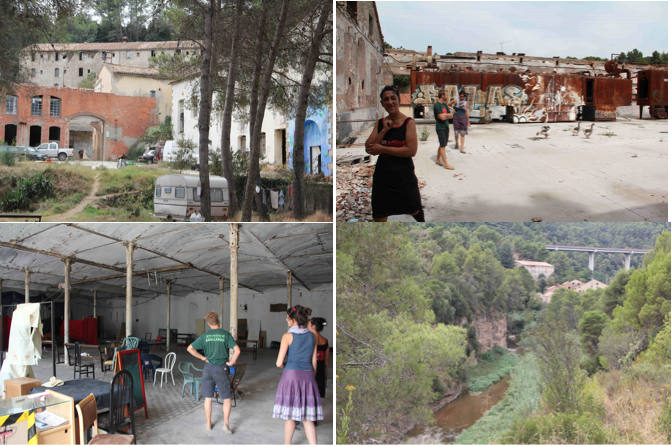 Two years ago in August 2013 Sonja, Daniel, Queralt and I did some research and visited communities, abandoned villages and new community projects in Catalonia. We visited several existing communities and looked at some places for sale. We did not have a strong research agenda, we visited and learned what occurred to us to ask when we there. The importance of vision or not, or of the importance of a strong ‘core’ or other group to start things off, were not at the front of our minds. We were just looking at possibilities. But reflecting back on that visit, using Sonja’s report as a reference, on the questions of vision and the need for a core group, I feel would be productive in thinking through our own needs in the Monastery and relate them to other groups. I also realise that my experience of these other communities strongly informed why I am so enthusiastic about the Monastery as a location for a future project. I also should say that my curiosity in these communities was also guided by having researched and lived in a particularly strong community culture in Vava’u, Tonga for two years from 1998 to 2000. I also carried the knowledge of living in shared houses in London for close to 8 years and working as a volunteer in a wonderful community/course centre in Sweden called Angsbacka. I was also privileged to have many conversations with a good friend Alex who has extensive knowledge of the key aspect of decision making in communities. He had spent much time doing ethnographic research in Auroville. I should also add that after living in Madrid from 1992 to 1993 and in Ecuador for a year I always nursed a desire to spend more time in Spain. Kanawen: A big community project that intended to buy an entire valley divided into five parcels and build a fully self-sustainable community of 100 members. Arcadia: The mother project of Kanawen, a successful centre for spirituality, therapy and renewable energy and living community for the last 20 years. Arlequi: A centre for dance run with many workshops during the year strongly related to CI. Cal Cases: An intentional community of 20 adults and 10 children that had been going for 6 years. Cala Fou: A post-capitalist community in an old factory with a fluctuating resident population of around 40. 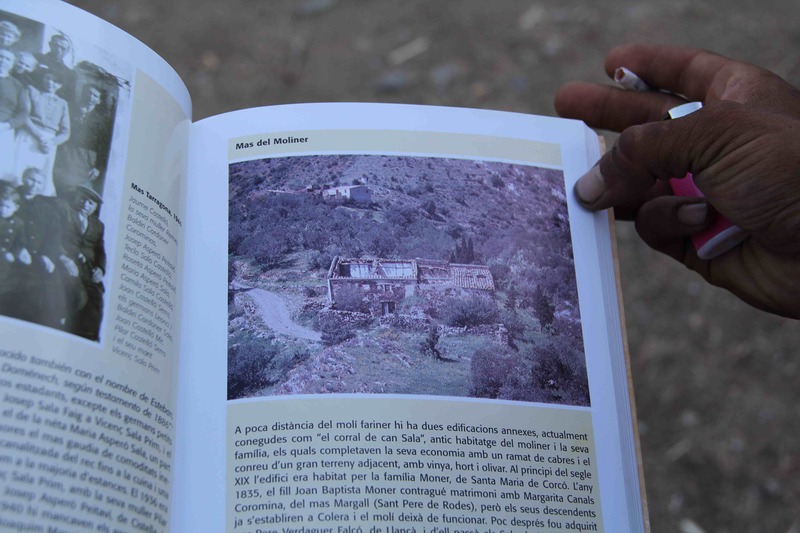 Molinàs- A project to rebuild a house next to an abandoned village for a living community of 8. Our visits were driven by personal interest and mostly facilitated by personal contacts. While we asked many questions, our research was informal rather than formal and related strongly to our own ongoing interests. So any opinion or statement on any of these communities should not be read as a statement of truth or evaluation, rather more as part of a conversation of understanding. 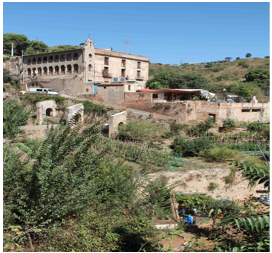 In April 2014 we returned to Cardona to carry out a visioning process and further research with a group of friends. We spent a lot of time together, formed a loose group that we called ASHA and visited local properties. Much of what happened on both visits has informed, to varying degrees, our position and interest in the Monastery of Dreams. Also being at the monastery of dreams has enabled us to update ourselves on what has been happening with other communities in the area and further expand on useful links and developments. Sonja wrote a report on our visits which I have copied verbatim. Each is followed by reflections and new information about each community or project prompted by our experiences at the Monastery. Mike found the information about this project on the Eco Village Network website and contacted them. Didier who deals with the international communication was very welcoming and invited us straight away to see the project and stay with them in their ‘transition house’. On 29th August we met Didier, his wife, their two children and two more members of the community in the transition house. Transition houses are the places where community members live until the actual houses in the intended valley are bought and built. In future they will also be used for a transition period for new members to accustom to the area and go through an educational programme before moving in with the rest of the community. Didier welcomed us and was very happy to tell us a lot about the vision of their project. There is a very clear procedure laid out for people interested in the project: you first read the mission statement of the community on the website, if you’re lucky you get invited by Didier to come and visit. Apparently they receive a lot of requests every day. Once there, Didier will talk to you to see whether you have similar ideas and fit into the project. If this runs well they will show you the valley that will be the future home of the community. We got off the car and before we had a chance to see the house and put down our luggage we had a two hour conversation with Didier. We spoke about practicalities, spiritual vision, housing, finances, membership, structural set up and future activities of the community’s members. Most of the information can be found in their online mission statement. We were impressed by how well thought through the whole project was. They seemed to have considered every detail. Later we had dinner with Didier’s family, a Spanish member of the community and an Australian lady that was visiting. Extensive conversation about the project continued. The next morning we went to see the other transition house. It’s a beautiful big house with a stunning view across the valley. A family from Zurich just moved there. With Anna, the mother, we had breakfast. She gave up her academic job in Zürich to join the project and will be actively helping to set up the school they are planning. Later Daniel and Queralt arrived and we went to see the valley (seems that we qualified). It’s a fantastically big piece of land; fifteen minutes drive from Girona once the road will be built. At the moment it’s all forested and there are five ruins of former farmhouses. The forest is very green, mixed trees and much more humid then around Barcelona. Most of the land is on a slope which makes it difficult to cultivate. Previously we had seen the architectural model for the first construction: A spiral shaped building that can host around 15 families in individual units. There’s also a big communal space and a restaurant planned. This project will cost over a million and will be finances by the community member’s membership fee (7’000E) and monthly rent (250E /person). Half of a fifth of the land has been bought so far (funders unknown) and now they need members to join that are happy to contribute from where they are or move into the transition houses. In addition to the building plans in the valley Kanawen has access to a big school and sports ground that they help manage. There they can organise courses and meetings and are planning to start an alternative schooling programme for the children. Didier’s wife educates her children at home at the moment. Walk into the valley, one of the ruins and the view into the valley from Arcadia’s grounds. The community will be organised in cooperatives that support its members to work and earn money. Currently they haven’t set what direction the cooperatives will take and they’re very open to dance and the arts to form part of it. There will certainly be a centre for therapy as quite a few therapists are involved in the project. Kanawen’s big example is a community called Arcadia, which is a successful centre for spirituality, therapy and renewable energy. Arcadia also started on a ruin and has now been successfully running for almost 20 years. However wonderful and well thought through it all sounded we also heard some critical voices. The Australian lady that stayed with Didier shared with us that she knows of a few members that have already left the project and she suspects this is because Didier and his family are really good at theorising the project but haven’t put much into practice so far. Didier in turn says that he wants to give a lot of importance and time to the process of finding the right people. I left with a feeling of finding this project attractive and interesting and I liked the people that are involved. Didier and his wife have expressed strong interest in us joining the project. However, I also have doubts whether all the good ideas will be implemented in the foreseeable future. I think it might take years for the building project to start. We did like thought the idea of a rented transition house before buying land. In July 2015 we learned through the process of unsuccessfully trying to get in contact with Didier that the project had been disbanded on the death of the founder of Arcadia, who had been a key figure in the development of the project. There had been around ten people still interested and committed to the project when he died, some of whom have stayed in the area. Some are grateful for having been brought into the area thanks to the project, an opportunity they are now developing in new directions. One member of the community reported that in the months before his untimely death of a stroke the founder had been wanting to push the vision of the community into a much more spiritual direction that some of the members had signed up for. They also recognised that the agreements with landowners were made before the crash of property prices and so they were no longer worth sticking to. In reflection, Kanawen was developed on an incredibly well developed vision, almost too encompassing, that perhaps inhibited a stronger group of committed members to take the group forward. It was premised on people accepting most of the vision without being part of the process of developing that vision. It seems to me in retrospect that that vision gave great confidence in the project, but it also inhibited it and meant that questions of inclusion and exclusion were present from the very beginning. 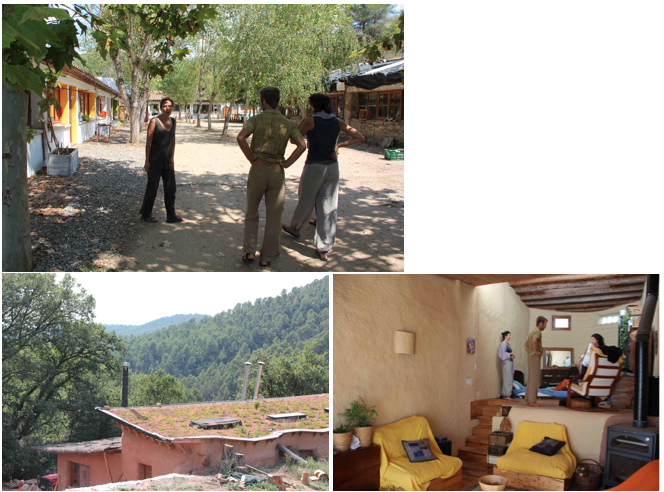 We did learn a tremendous amount about the project and were particularly struck with the idea of a transition house that allows people to live in the area and test out their own feeling and process in relation to community before having to commit to a particular place or a particular group of people. It was sad to learn that so much creative process and visioning had not developed beyond planning. But then if lessons were learned and all the people who had partaken in the process had got closer to realising more particular and personal plans, there had been benefits experienced. Only two minutes drive from Kanawen’s transition houses is the dance centre Arlequi. When entering the site we met a group of CI dancers that we knew. This felt like coming home. Mike and I loved the building and Daniel said there’s lot’s of those houses around. The lake Banyoles close to Arlequi was somewhat disappointing even though it’s one of the only natural lakes in Catalunya. Swimming was only permitted during certain times and in enclosed areas. Arlequi is still going strong, but there is some evidence to suggest that numbers on workshop organised by them are dropping because of the financial crash. Thomas Kampe was on his way to teach a workshop there, when he dropped in to visit us on the way. To have Arlequi so close to Pontos, we see as incredibly useful and valuable. It has been an important dance centre and place of workshops for CI over the years and its continued existence demonstrates the viability of a dance centre in this region. A twenty minutes drive along a stony road from a little village is Can Cases. A friend of Queralt’s received us and showed us around. Can Cases is a community of 20 adults and 10 children that have been living together for the last 6 years. They have one big communal house, which was there from the beginning and allowed the group to move in straight away. The house and land’s value was 450.000 E. Behind the communal house they build small individual units for each family or individual. This reminded me of a Mexican village with a village centre surrounded by small white houses. On the other side, a bit more hidden they are in process of finishing eco-construction houses made out of straw bale and mud. We had a chance to see them from inside. Apart from keeping the heat from the sun in winter and cooling in summer they are visually very attractive. In Spanish law it’s difficult to get permission to build unless it’s on an already existing foundation. This was not the case with these houses. Ruins can only be extended by 20%. The community meets every Sunday for practical meetings and emotional sharing. Even though they say that there’re not a spiritual community they realised that space needs to be given to emotions and personal relationships, otherwise ‘discussions about where to buy the toilet paper becomes a hidden discussion about personal conflicts’. The meals are always shared and one person cooks each meal for the community. It was a beautiful big table full of people with an array of vegetarian food. One of the residents told us that the process of finding a house has taken them over three years and in the end they abandoned most of their criteria (e.g. close to a town) because they liked the place so much. Some of the members work in the community, e.g. brewing beer or producing pasta, others have a job in Barcelona or in the surrounding area and commute. Everyone gives the same contribution to the community, this can either be done with working hours or with the equivalent in money. I left with a very good impression and felt that this could be a place I would very much like to join. It seemed really down to earth with a strong emphasis on simply being human and living together. The community has experienced media attention on TV recently and seems to be still going strong. The builder of the straw bale house wrote an extensive blog post describing the process. I do not know the details of the visioning process they went through at the beginning, but it seems very clear that their visions had to be adjusted to the reality of what was available to buy. In that process, some people dropped out the project, not willing to compromise on their vision. I wonder what the attachment to a particular vision serves, if it eventually stopped some people becoming part of a very active community. Where can the space of compromise of vision be a space of profound learning about what actually informs our desires for community? In terms of group work, one thing that very strong defined the group that developed Cal Cases, was that they were all part of a co-operative group in Barcelona and they had a lot of time to work and research together and feel into imagining living together. I felt there was strong point of comparison in their being part of a wider network in a co-operative and us being part of a much wider network of people connected through CI. 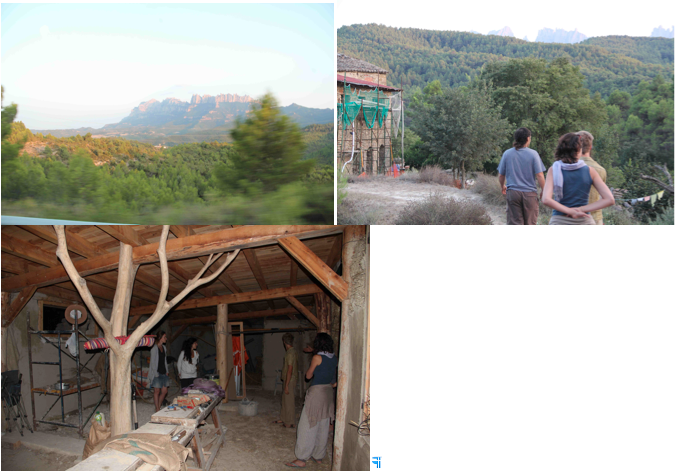 After spending most of the day at Cal Cases we went to visit a new project that a few friends of Queralt’s are part of. It’s a group of around 20 people from Manresa that are in process of building a community project in the mountains of Montserrat. It was already late when we arrived at Irehom and we saw the beautiful evening light with a view to Montserrat. The land of the project counts three buildings, one that is in process of being rebuilt by the community member’s themselves into a big communal /workshop space and a kitchen. One small house can already be lived in and four people live there and another big one is not safe to enter and needs rebuilding in order to be used. One person owns the land and currently there are no written agreements of how the community will be organised financially. We felt that this is a big risk. The group seemed very enthusiastic and young. They want to build a centre for education, spirituality and sustainable energy among other projects. The couple we met built a straw bell house for themselves next to the main houses. I really enjoyed the view from this place and felt the potential this place has, there seem to be a lot of great ideas around, but it is very hard labour for the community’s members without a clear financial plan. It is quite remarkable how much the centre has developed over the last years, at least evidenced by their webpage. It would be very interesting to learn how the social dynamics are with ownership in one hand, and how people can feel a sense of ownership of the project they are involved with, without needing to have actual ownership or part ownership of the place. We spent the night at Can Masdeu, Daniel’s wonderful community. 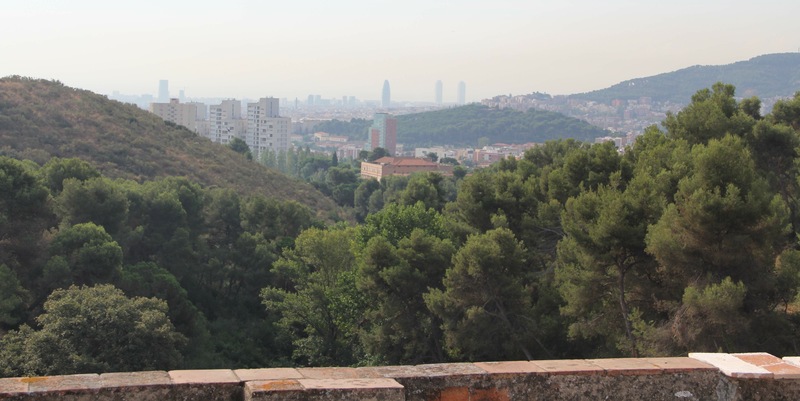 I love the view of Barcelona from there and the fact it’s so close to the city and yet with such a natural feeling. 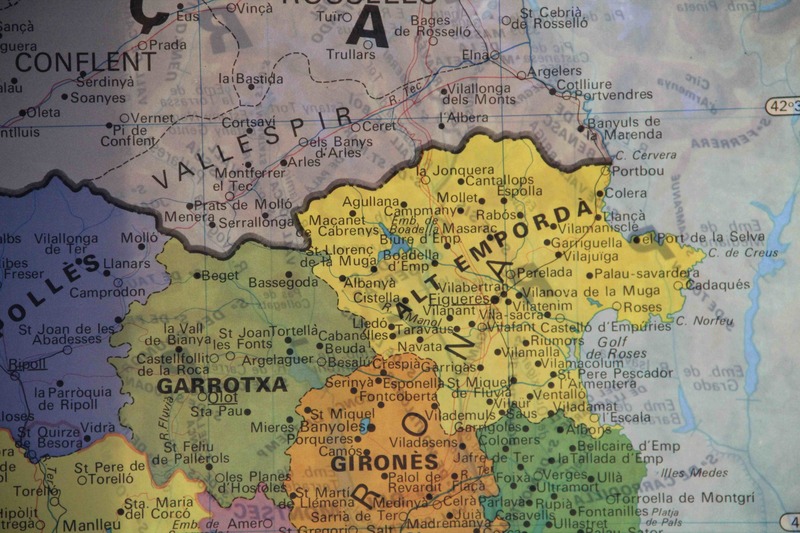 Can Masdeu is a vital hub in the development of communities in Northern Spain. So much happens because of the role Can Masdeu plays in facilitating meetings and education. It’s historical involvement with the local community was vital to its survival and continues to this day. Daniel’s experience of the value of this engagement has strongly informed our feeling of communicating and engaging with the community of Pontos as soon as possible. In fact the confidence to do so and its value is well demonstrated by Can Masdeu. There is also much to learn in how they manage visitors and how they decide who is to be welcomed into the community. Even though they are an anarchist community there is a long process to becoming a recognised member, that involves long term residence. That necessary process and degree of exclusivity was very different in Cala Fou, which both benefitted and suffered from it extreme open door policy. They have become so popular that having visitors all the time posed a real challenge to community feeling. They now operate a month on, month off system, with visitors only staying during the on months. Calafou is a massive former paper and fabric factory built next to a contaminated river under a road bridge. Approximately 40 people live there. On a big board at the entrance we read: Post Capitalist Community. We met one of the members in her little flat, which she says is very cold in winter. Apparently below was a water tank, which she found out at some stage and emptied. Cala Fou has an extremely open visitor policy which means a lot of people come and go and there is little control who stays. 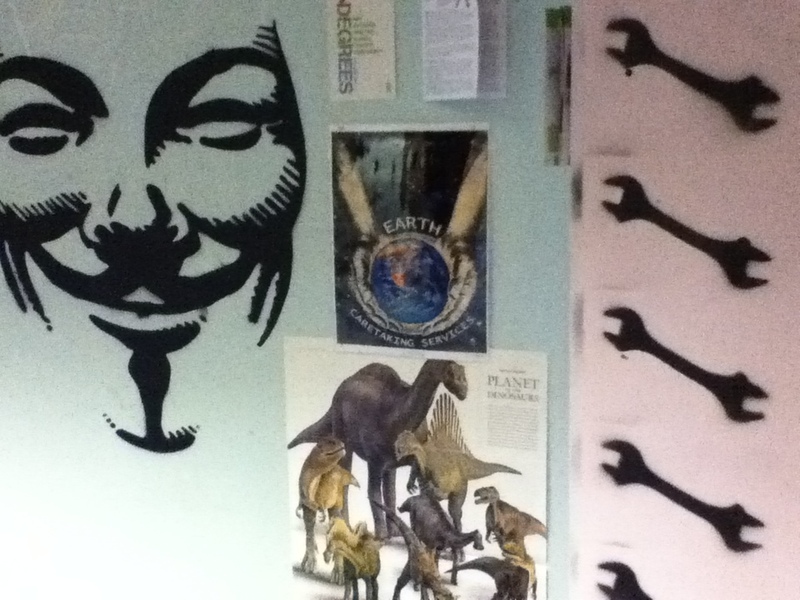 A big part of the community dedicates to hacking activities in their computer room. Some members work outside the community to be able to pay for their rent. Several of the buildings have collapsed or burnt down. There are no finances or clear plans at the moment to build them back up. The river and land next to the factory are still contaminated from the time when paper was produced. I couldn’t get a clear picture of what their ideology is apart from being against capitalism. Cala Fou faced challenges in accepting all people who came and incorporating them in functioning structures. It now has a defined visitor policy. It has become a bastion for people all over Europe, there were many vans with German number plates in the car park when we were there. Sonja’s brief description perhaps reflects that she she did not personally resonate with the place. But we were both in awe of its existence. The story how they got the money to buy it from a Spanish Robin Hood character who borrowed from the banks to give it to the group that founded it, and then went on the run, is fascinating. There is much more to research about this remarkable place and how it is working now. The only thing we heard on the grapevine when mentioning Cala Fou in conversation, is that the ideological founder has bought land in the Garrotza and wants to set up a smaller eco community there. It continues to inspire people, as I learned in a jam in the park in London Fields where I learned of someone passionately interested in visiting after reading about it in on the blog of the P2P Foundation. For me now, in relation to the Monastery of Dreams, it signifies the challenges of being too open and not having a recognised process of people requesting to visit. While much in their post-capitalist ethos is of interest to me, I feel more committed to community practices and ethos that do not pose a fundamental break with the past, nor aspire to utopia or strongly reference dystopia. 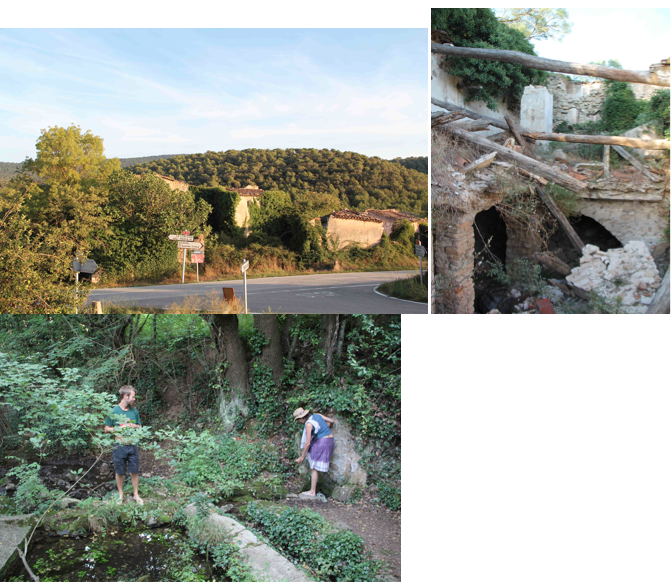 In searching for an abandoned village of 14 houses for 250’000 Euros we drove straight past it without realising. We found a village of a similar name, slightly deserted but all well cared for and we got suspicious and guessed that it can’t be the one until we met an old man who cleared the matter for us. So we drove back and found Esblada: an accumulation of ruins, barely visible from the road. From a winegrower nearby we found out that there is a never-ending fountain as part of the land. We ventured into the overgrown valley and found a lovely microclimate of fruit trees and bushes. Around the fountain were two pools for washing and an abundance of clear fresh water came out of the hillside. Mike really liked the place, but I wasn’t drawn to the fact that all the houses are on a steep slope and the valley felt very enclosing to me. 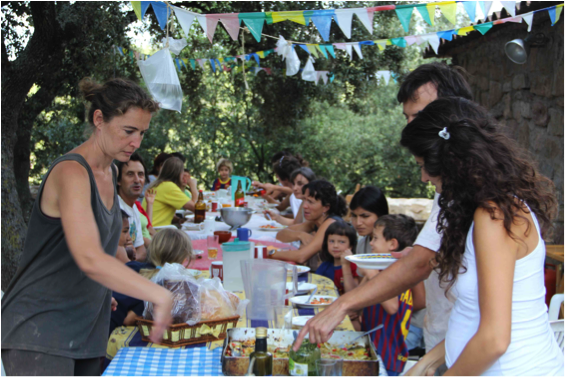 A group of people from Barcelona formed a housing co-operative about 6 months ago and the final purchase is imminent. Some of the group are already living nearby. Daniel reported that the group needed to get public vouchers together to be access the Coop57 financing they were seeking for the purchase. Public vouchers are pledges by other institutions and people to cover the debt should the co-operative not be able to pay mortgage payments. 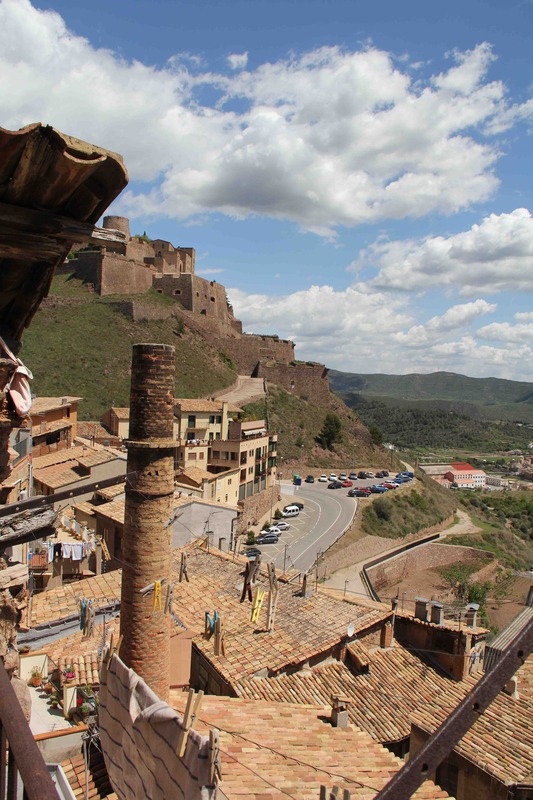 Abandoned Spanish villages have captured the public imagination on Facebook and global media. There is, however, little critique of the context of what makes such opportunities so attractive: prohibitively expensive housing in the UK and the hugely unequal distribution of land. The attraction of such places for our group in our visioning was insightful, as it also revealed preferences of living environments and the ability to invest and improve one’s own nest, as separate from the whole community. Findhorn is an example of a community that also provides this opportunity and people can now buy and sell property there, on a more open market. Having one’s own house in a village that could then be bought and sold was a middle ground that served both the need get benefit from an investment and also be part of a community. The current property market in Spain means that old properties in rural areas are not regarded at investments, they are both difficult to buy and to sell. They are difficult to buy because prices are inflated because of an impression of rich foreigners coming to buy and paying ridiculous prices. So there is a lottery mentality of people putting property on the market that they don’t really want to sell but will if it makes them a fortune. Selling on is also a challenge, because of inflated market prices that no-one want to pay, and then the lack of accurate reference point for what the value of a property is now. The extensive negotiation and coming to a price is against the ethos of many Northern Europeans. There is some value however, in accepting, that becoming part of a project of transforming a property cannot be profit making in monetary terms. Structuring out the possibility of profit, would also ensure a longevity of the project by ensuring co-ownership. But will this please all people who would want to contribute? 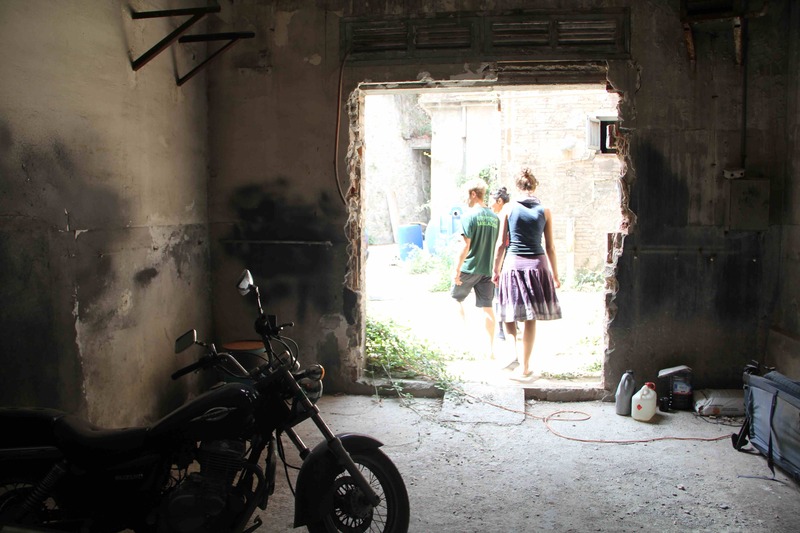 What does money and investment really mean to people are questions really worth exploring as they are at the heart of much anxiety and can inform the attraction to living in an old building or abandoned property? The challenges of buying and developing abandoned villages is often underplayed. They are often in very remote places or in places difficult to access. In developing a dance based community, accessibility is very important to ensure visitors for weekends and for longer stays from overseas. Pontos is ideal in this way. The contrast between the accessibility of Esblada (which is actually more accessible to Barcelona than most advertised abandoned villages are) and that of Pontos was one of the reasons why the Monastery captured Sonja and I so much. Abandoned villages also don’t have the opportunity of such close community involvement beyond the actual community. They have by definition been abandoned by the community who had a historical and familial relationship to me. The last project we visited was the most remote. The last project we looked at was supposedly another abandoned village that a community is building up. This time, which is rare, it was very close to the sea in the very north of Cataluña. We met three of the guys in Colera, close to the border with France, and followed them with our non-off road car along a steep very stony road until we got to an group of houses. The guys explained to us that nobody lives in the village anymore but all houses have an owner. However, after many years of administrative effort the council gave one ruin to the group to build up and move into. They are a group of eight young people that want to live in an eco-community in the countryside. Most of them have been unemployed for quite some time and are now looking for a new way of living. With no finances and hand collected materials they are now rebuilding the house by hand. In the meantime they live in tents until they will be able to move into the stone house. Water is an issue, there are two fountains but they often dry out. The house is next to a major hiking route and the group is planning to produce goat’s cheese and bread, which was the tradition in this village. They are hoping that on some point they will be able to expand and take on a few more houses of the village. When asked by a visitor to the Monastery about this project, I realised I had completely forgotten exactly where it was. This was not the case with all the other places I visited. 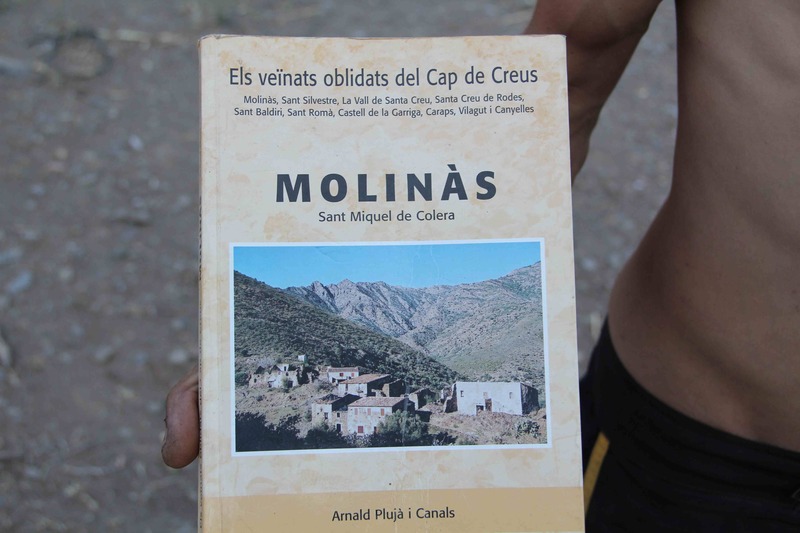 Somehow, the opportunity of Molinas also made me sad, in a way that other community projects did not and influenced my memory of it. Arriving with recycled items to use in the house. The guys struck me as very industrious but also as signing up to a capitulation to not being able to live where they wanted closer to family and friends. The drive to their place would take its toll on their van as it would on them, and I felt the support they were given, as they described was not really sufficient to do justice to their energy in the project or the building itself. I got no sense of a strong ideological focus, like at Cala Fou, that unifies and also prompts curiosity and thence support from people. 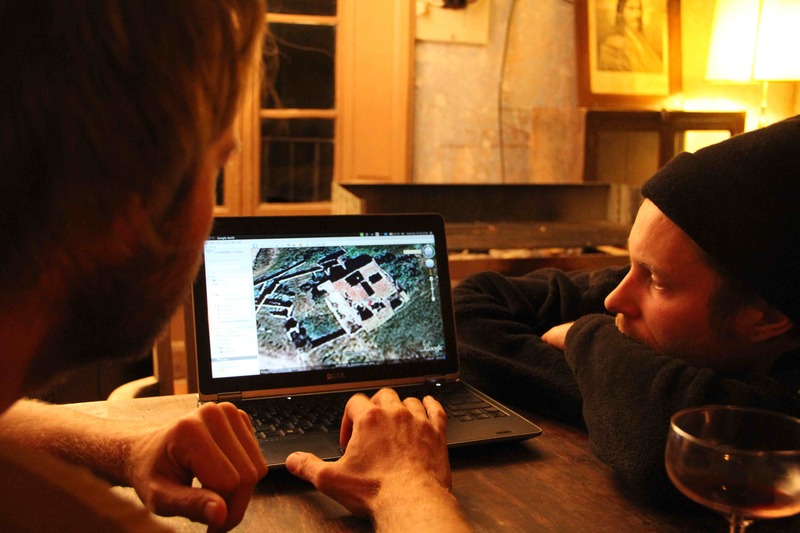 I found myself while there constantly imagining of what might help them become more connected to wider projects and collectives, and how on earth they would be able to make any money or live in the winter in that ruin. In the fourth photo Sonja is looking at a historical book about the nearby village that they had and that at the very least was one way to prompt curiosity about their project. Speaking with them made me aware of the scourge of youth unemployment and lack of housing being suffered by so many people in Spain, that somehow in visiting such active communities who had already managed to deal with the financial crisis, I had put to the back of my mind. And yet, as one of the key motivating structural drivers of the desire for living in community in Catalonia and of the opportunity of cheaper prices for those coming from overseas it was somehow not being addressed in a critical enough fashion. For those outside Spain, the financial crisis created an opportunity. That opportunity cannot be grasped ethically without critiquing its origin and participating in projects to somehow address its impact. Perhaps, this is more possible in Pontos with the possibility of more local collaboration. Perhaps another strategy is to offer the Monastery as a place for meetings of co-operative group that address the crisis in many different ways, in a similar mode to Can Masdeu. What is not possible to my mind after this reflective journey of the communities we visited two years ago, is a focus of isolation or sustainability that is disinterested in the wider politics and social situation of people around the monastery or indeed the region. This reflective journey brings me back to questions raised in the Monastery of Dreams. I am drawn more toward the value of having a strong core group before having a group vision. This gives a vital sense of trust and confidence in continuity and that the considerable contributions from people can be held and valued. A core group is not about hierarchy or power if done properly but about establishing confidence for those involved and those interested. For me, the group vision is something that should develop gradually out of not only the dreams of people but of the practicalities and realities of their lives and their commitments. The group vision also, I feel, needs to give value to how the local and wider community surrounding the intentional community could engage and benefit from its presence. In some places the need to create a coherent sense of group through group visioning is a vital part of the process of keeping a group together and creating a sense of identity, that may or may not be one deliberately counter-posed to what is imagined as mainstream, or ‘capitalist’ society. In reality, we cannot escape from the patterning in our very psyches of mainstream and capitalist society. But there are creative ways to recognise their influence and be more reflective of how they contribute or detract from living beneficially in community. Map of the region at Cala Fou. My interest is to learn more about the small number of dance based communities and read more about Sociocracy, which is widely recognised to be a means of decision making in non-hierarchical ways, that addresses the many challenges many communities have had with consensus decision making. I also am more curious about how we can use video to reflect on the challenges of visioning and group formation. I also feel that just the idea of visioning would benefit from visual anthropological scrutiny. Why is one sense, the most distancing of all senses, given preferential descriptive value in the process of deciding a common future? Does the idea of ‘visioning’ give enough attention to the presence and bodliness engendered by dance and improvisation. 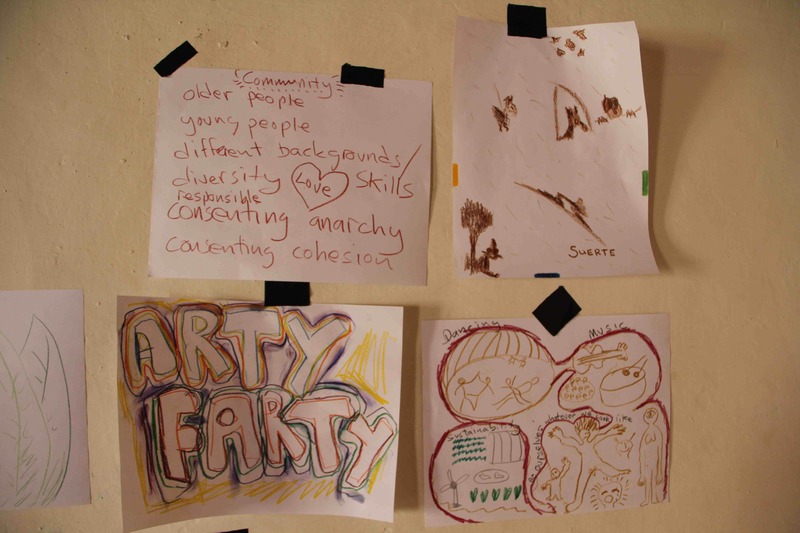 Can we imagine another term, perhaps more sensitive or descriptive, of how a creative and improvisation based community, would want to start planning its future?